When updating my 89-year old mother's PC, I found it very useful to be able to reboot (one time only) from one boot partition direct to another partition on her PC. I live in Europe, and my mother lives in North America. I find this is very useful when I am accessing her PC remotely (from Europe, when her PC is in North America), and I need to access a different partition on her PC, and I do not want to ask her to reboot the PC. Ok, I didn't realize that I have my own blog here. So I think nI'll be taking a little time to figure out what is here, what have other people done, and what I can do with this to make it useful. This blog entry describes some of my early openSUSE-13.1 experiences with a Foscam FI9831W IP-Camera using openSUSE-13.1. First let me say this IP-Camera works well with my Android device (and WinXP under Virtual Box), albeit I don't yet have full native openSUSE GNU/Linux functionality. The liveKDE 64-bit openSUSE-13.1 works well on a USB-3.0 memory stick with my Toshiba Z930 Ultrabook's USB-3.0 port. 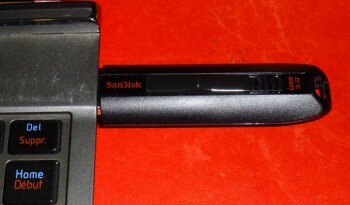 In particular this is a 16 GB Sandisk Extreme USB Flash Drive and I have to say I am quite impressed with it.